I have to admit my ignorance, I wasn’t even aware that there was a stage play of Frederick Knott’s classic, having only ever seen the excellent 1967 film version staring Audrey Hepburn, so my interest was immediately aroused by this with its obviously required special lighting effects in a dark basement flat environment. For those who have not seen this, the plot centres around Susy Henderson, a blind woman whose photographer husband innocently transports a doll containing heroin from Amsterdam to Notting Hill on behalf of a fellow passenger, but when she contacts him to pick it up, the doll is nowhere to be found, having been ‘stolen’ by the young neighbour who sometimes helps out with various chores. Whilst her husband is away on business, a man turns up pretending to be an old friend of his and soon has her trusting him as they search for the missing doll. The complex plot twists and turns as various characters, none of whom are what they claim to be, come and go adding tension to a taut thriller. 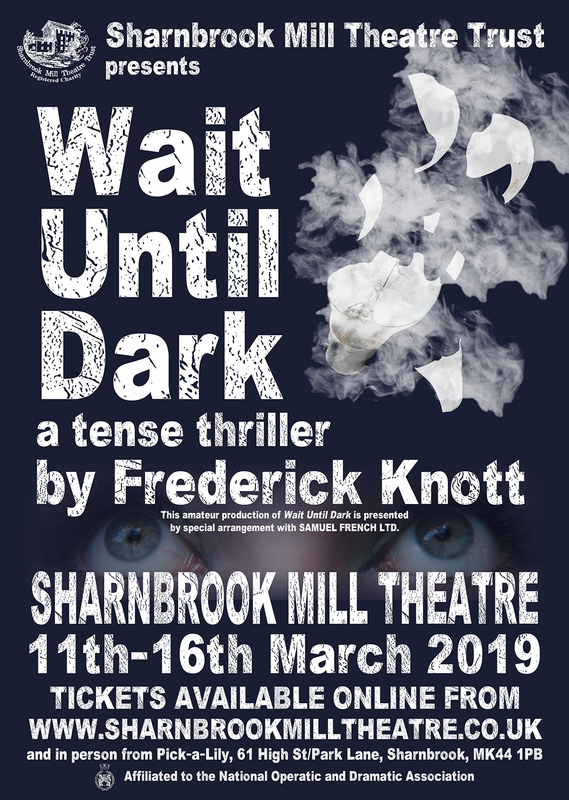 The stage at Sharnbrook, as Nicole Macdonald says in her director’s notes in the excellent programme by Michael Horne, is absolutely perfect for this play with its large balcony above the main stage. Stage Manager Brian Wood and the rest of The Monday Team, Kevin Beirne, Gerry Stafford and Ron Johnson had certainly gone to town on this one, with a cut-out brick wall on the upper level, exit notices to both the other apartments and the local underground station, a front door and inside, a steep staircase descending to the living space of the basement flat, which was a full box set with a bedroom door and kitchen pantry door, set with sixties period furniture. A kitchen sink which was straight out of my own childhood, complete with the underneath being curtained off, a washing machine and of course (spoiler alert) the all-important fridge, complete with interior light. Lighting was the intriguing bit and was, in fact, rather cleverly done by Ricky Johnson. The initial gloom for the opening scene as the three mystery figures enter the apartment set the scene well and shadows created from the single desk lamp, the eerie street lamp through the blinds of the kitchen window, through to the final fridge-only illumination all drew one into the tension and atmosphere. In fact, when the lights in the apartment were first switched on it took a moment or two to overcome a false feeling that it was too bright. Neat job guys. I’m sure Mark Luckin and Ronan Douse did a great job with the sound in an un-miked production but my elderly ears struggled to pick up some of the speech in the initial scenes. My bad I suspect..? The usual team of Sue Lander, Ann West, Sue Breach, Gill Ridley and Virginia Pope dressed our actors in suitable period attire while Sue Lander and Zandra Saxby provided a great array of sixties props including a whole raft of old cameras and kitchenware. Attention to detail was as usual, top notch. This was a great cast, which was obviously well-rehearsed and not a weak link between them. Kathryn Rose was excellent and very believable as the blind Susy Henderson. Even her trips and falls over misplaced pieces of furniture were spot on, not an easy thing to get right. She was particularly impressive in the last scene where she demolishes the interior of the fridge. Richard Llewellyn had the hardest task as Mike, as he built up a relationship with Susy, duping her into believing he is an old friend of her husband’s and, as the relationship goes on, his sympathies gradually tend more towards her. This was done with a deft and subtle touch. Ken Wilde was very believable as the con man ‘police officer’ Croker and was clearly enjoying every moment of it. Gordon Ritchie as Roat was wonderfully evil, not an endearing feature to be seen. I note from the programme that, although it is his first time at Sharnbrook, he comes with a considerable amount of experience, which showed through in spades. A commanding presence on the stage and I hope to see a lot more of his talent in the years to come. Condoleezza Hankins is obviously a talent with a future, here as Gloria showing a maturity of acting way beyond her 15 years, as she demonstrated a wide range of classic teenage behaviour, devious, petulant, innocent, fun-loving and determined. Super piece of work. 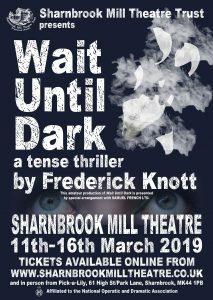 Clive Minor as Susy’s husband Sam has obviously brought his experience to the Sharnbrook stage in this cameo role in which he was totally convincing. Connor Jeffery and Alison Moles completed this excellent cast as the two police officers who arrive to make the arrest. My only criticism: smoking! If you have to have it in a play, which you did in this plot, please do it properly, it was obviously none of the actors even knew how to hold a cigarette let alone smoke or even light one which meant it looked a little unrealistic. Director Nicole Macdonald had certainly put her heart and soul into his one and it paid off handsomely, the cast were (as I said) very well rehearsed, the pace zipped along and the audience were drawn in and concentrating from beginning to end. A thoroughly enjoyably thriller and a good night’s entertainment. Well done one and all! Many thanks as usual to Dave Oliver and his FOH team for their excellent hospitality. Always a pleasure.